Clubhouse with changing rooms, bar, restaurant, spa, leisure facilities and accommodation also onsite along with a pro shop. Golf facilities include a practice ares, putting green and equipment hire. 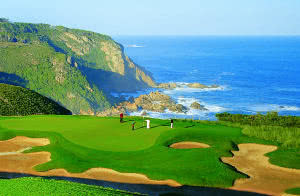 Pezula Championship Golf Course adjacent to Pezula Resort Hotel & Spa is a sweeping spectacle of fairways and greens rolling through the pristine Southern Cape landscape. The breathtaking, award-winning 18-hole course which was designed by David Dale and Ronald Fream of GolfPlan USA, rates amongst the best and most scenic golf courses in the world. The front nine is routed in an anti-clockwise loop a little way back from the cliffs with water in play only once. The back nine is also laid out in an anti-clockwise direction and includes a lovely sequence of holes from 13 - 15 above the cliffs overlooking The Cove. The signature hole here is the short par four 14th, where big hitters might attempt to go for it off the tee, they should be aware that anything short will be captured by a virtual desert of sand and anything sliced will be lost forver in the thick cliff top vegetation.